W I L D B L O O M : blogging // resources. i love blogging. i love other bloggers and their words and photos. i love this community that turns strangers into friends. i also love the creative process of blogging. there are several resources i use to make it run smooth. blog journal // after months of dull and repetitive content on the blog, i wrote this post in an effort to find some clarity among the chaos. after pressing the publish button, i grabbed a journal and began to write down potential blog posts. it was like the inspiration floodgates had opened. new ideas and concepts swirled around in my head, filling up several pages of that journal. my fingers and pen could barely keep up with the pace. i now carry that blog journal with me wherever i go because inspiration is everywhere. -blogging resources: for printables and tools to assist in the creative process. 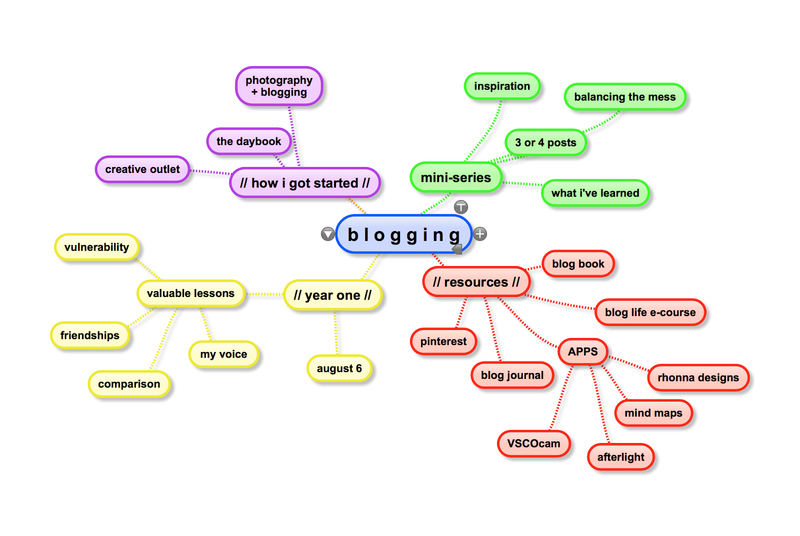 -blogging articles: information about skills, techniques, and lessons on blogging. -writing: my biggest hurdle with blogging is stringing coherent thoughts together. -blog design: i am gathering inspiration for a new blog design or possible re-brand. blog life e-course // it's no secret that i'm a huge fan of a beautiful mess. i am currently working through their blog life e-course. i have been blogging for over two years now, and by no means am i an expert. but i am a firm believer in constantly learning and soaking in knowledge every day. if you are thinking of buying this course, DO IT. i was already highlighting new information just in the course introduction pages! APPS // there are a few apps that help with the blogging process. VSCOcam & afterlight for editing photos. lately, i use my iphone for every photo, so these apps are a must. rhonna designs. i use this app for adding text and shapes on my images. simplemind. i am completely obsessed with this mind mapping app. it is so, so helpful in creating and outlining posts.